October 30, 2018 /3BL Media/ - The Global Microscope on Financial Inclusion, now in its 11th year, is a benchmarking index that assesses the enabling environment for financial access in 55 countries. 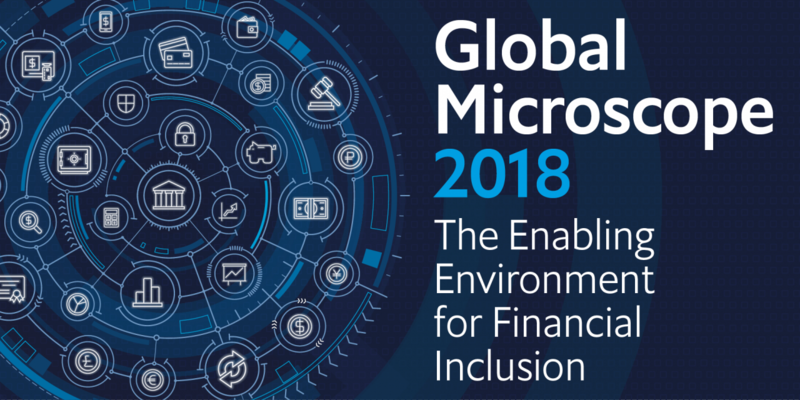 The 2018 Global Microscope underscores the evolving landscape of financial inclusion itself. This year’s index was completely revised to take a forward-looking focus on digital financial services, and to address the critical role of financial inclusion envisioned in the Sustainable Development Goals (SDGs). This year’s Microscope assesses the enabling environment for financial inclusion across five domains: government and policy support; stability and integrity; products and outlets; consumer protection, and infrastructure. The Microscope evaluates the regulatory and policy environment for key players in the financial inclusion space, including banks, non-bank financial institutions, e-money issuers and cross-border payment providers. It also focuses on the role of inclusive insurance, financial agents, financial technology (fintech) firms, and credit information providers. The Global Microscope is produced by The Economist Intelligence Unit (The EIU), with financial support and policy advice from leading organisations in the field, including the African Development Bank, the Bill & Melinda Gates Foundation, the Center for Financial Inclusion at Accion, IDB LAB and IDB Invest, and MetLife Foundation. First published in 2007, the Microscope is the global standard for financial inclusion policy in developing economies. The top-performing countries in the 2018 study demonstrate government and policy support for financial inclusion, prioritise financial stability and integrity, and foster inclusion through a variety of products and outlets. Colombia,Peru and Uruguay hold the top three spots in the overall rankings. Of the top five, only fourth-ranked India has yet to issue a financial inclusion strategy, although the country is following a coordinated, three level-approach, and publication of a strategy is expected during the 2018/19 financial year. Rwanda and South Africa stand out for the most enabling environments among countries in sub-Saharan Africa (SSA), tied for 11th place overall. In terms of stability and integrity, leading countries also feature market-entry regulations that do not deter new players that serve low and middle-income population. A common strength among top-ranked countries is the ease with which customers can access a variety of financial products and outlets. E-money is making inroads, becoming more accessible as a wider variety of providers are able to enter the market. Most countries in the 2018 Microscope have made efforts to facilitate new digital providers and generally had few market entry restrictions. This positive operating environment globally, along with client demand, is helping e-money to become a leading digital financial product. However in three countries (Chile, Guatemala and Vietnam), there is no legal recognition of e-money, and 16 countries have opted for bank-led digital transformations. The research suggests that competition and innovation can make e-money more accessible, especially if a wide range of institutions can become e-money issuers. Although many countries in SSA and Middle East and North Africa (MENA) score well on government and policy support, a lack of connectivity infrastructure and digital identification systems limits the expansion of digital financial inclusion. In terms of connectivity, most of the SSA countries in the index have substantial room for improvement—although South Africa, Senegal and Ghana scored among the top half of countries in this category. Infrastructure for payments also has considerable room for growth in both regions. Technology introduces new risks, and many countries still must update cybersecurity laws and develop their capacity to enforce data privacy protections. In 35 of the 55 countries in the 2018 Microscope, consumer protection regulations generally facilitate financial inclusion, and previous editions of the index have shown gradual strengthening of these protections over time. As digital financial services expand, new consumer risks emerge; in the best performing countries, therefore, traditional consumer protections are coupled with data privacy and cybersecurity safeguards. Colombia and South Africa have dedicated financial consumer protection frameworks and specialised enforcement capacity, as well as government entities with a strong capacity to enforce data protection laws. However, in most countries data privacy protections are not well developed—42 countries have limited or no capacity to enforce data privacy.